Apple has revealed a new health-tracking software platform at its ‘Loop You In’ product launch event. CareKit is a software framework designed for apps that let people with Parkinson’s and other chronic diseases better understand and manage their condition. 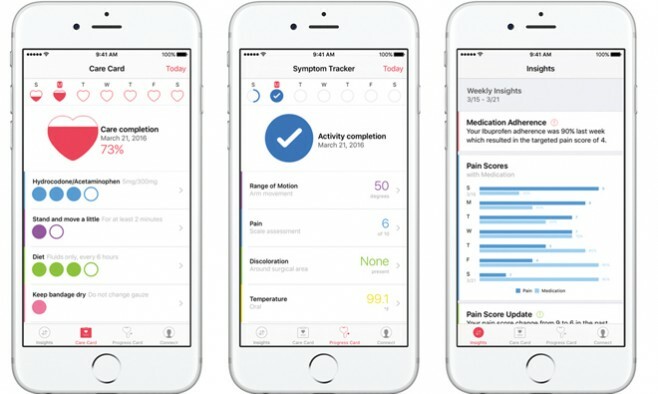 With the introduction of the platform, Apple aims to put patients back in charge of tracking symptoms and medications with the use of a smartphone. Though CareKit won’t be fully available until next month, one of the apps to have first access to the platform is for people with Parkinson’s, and will monitor the effectiveness of medication used to treat the condition. After the success of ResearchKit, the study-focused platform that enabled medical researchers to gather highly individualised data on a large-scale, Apple decided to widen the scope from medical research to personal care with the development of CareKit. Developed by Sage Bionetworks and the University of Rochester, the first app built for ResearchKit was mPower, which claims to be responsible for the biggest Parkinson’s study to date. Dr Stephen Friend, president of Sage Bionetworks, said: “mPower allows researchers to follow day-to-day fluctuations in Parkinson’s disease symptoms and allows for insights that would be impossible to achieve when a patient is only being examined every six months. Apps built for CareKit will be able to utilise specialised ‘modules’ such as the so-called ‘Care Card’, ‘Insight Dashboard’, ‘Symptoms and Measurement tracker’ and ‘Connect’. ‘Care Card’ keeps tabs on your medication or physical therapy needs, essentially creating interactive to-do lists that remind you when to take your medicine. ‘Insight Dashboard’ maps progress over time and can reveal which treatments are actually working in relation to symptom fluctuation. ‘Symptoms and Measurement tracker’ takes advantage of the iPhone’s high-tech sensory capabilities such as accelerometers, microphones, gyroscopes, cameras and GPS. For example, the phone’s microphone can record and analyse the subtle changes in the voice of Parkinson’s patients, or the gyroscope and accelerometers can sense a range of motions like fluctuations in gait. ‘Connect’ allows all this information to be shared with doctors, healthcare teams and family members.